If you're a fellow food blogger, can you tell me how you keep up.. I mean the cooking part... I get down with the cooking part. But then there are the pictures and the editing and then you have to type something interesting and somewhat engaging (which I still have not quite grasp the concept of) and that all has to make it here on this little blog. Oh and then you have to tweet about it, or facebook, tastespot, foodgawk..all the while trying to instgram pictures of your lunch and pinning/repinning until you can't pin anymore.. There are bloggers out there who post 3-4 times a week. That is commendable.. sometimes I have to ask myself, is it because I'm not as committed. I just went way to the left there.. sorry.. Have you seen that movie Place Beyond the Pines.. you should... he's in it..with his shirt off. Anyway, let me get back on track.. back to the point of this little blogger space.. 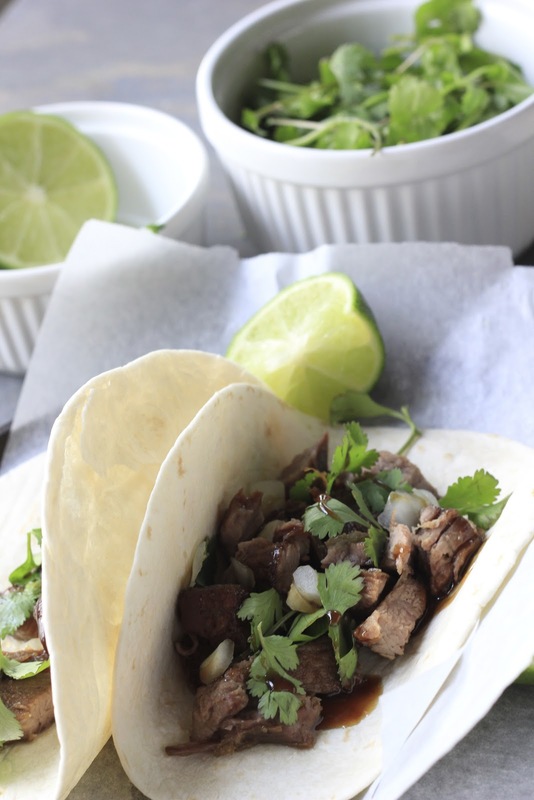 These Sweet Whiskey Steak Tacos..
With the brown sugar, bourbon, and spices that go it this marinade, it's become a big hit around here. This marinade has just the right hint of whiskey, not to over powering. It's also quite tasty glazed over some grilled chicken.I let the meat marinade over night for these, but I've also made them with a smaller amount of time. So they only were able to marinate for an hour and were still insanely out of this world. We keep our taco toppings simple, here there is just a little cilantro mixed with some chopped onions and a twist of lime. Feel free to dress them up more, but sometimes less is better.. Except for when it comes to blog post..
Whisk together all ingredients of the marinade. Put steak in a large bowl and pour marinade over steak. Cover with plastic wrap and refrigerate for at least 1hr. For the steak in the picture, it marinated over night. Preheat a grill or heavy skillet over high heat. Cook the steak in batches, turning over once until both sides are well browned and cooked to your liking. About 6 to 7 minutes on each side for medium. Let steaks rest rest on a plate for about 3 minutes , then slice into strips and then again into smaller pieces. Serve topped with cilantro and chopped onions on warm tortilla. the excess "juice" from the cooked steak is also good drizzled over top of the steak.